Summary: A New York Times bestseller, the shocking story of one of the few people born in a North Korean political prison to have escaped and survived. 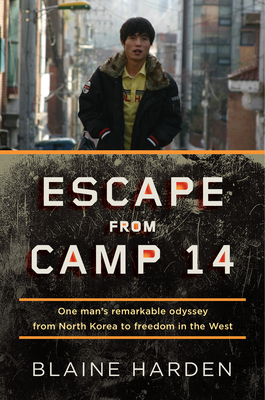 It might come as a shock to some of you that I am reviewing a non-fiction title rather than my father; however, I occasionally do read them... especially when the story is as amazing as ESCAPE FROM CAMP 14: ONE MAN'S REMARKABLE ODYSSEY FROM NORTH KOREA TO FREEDOM IN THE WEST by Blaine Harden. This book is about Shin Dong-hyuk, one of the only people born in a North Korean prison camp to have escaped and survived; and it is fascinating -- I couldn't put down this book. While ESCAPE FROM CAMP 14 was utterly gripping, it was also a darkly depressing book. I don't know if I can go so far as to say that I enjoyed this one, but I did appreciate it; and furthermore, I liked that I learned so much from reading it. I am the first to tell you that I'm not that savvy on a lot of current events (and I don't know a heck of a lot about North Korea), and maybe I'm naive, but I was blown away by what's going on in this country. I knew the political regime was oppressive, but I honestly had no idea that political prisons like Camp 14 even existed. ESCAPE FROM CAMP 14 covers a lot of ground for a relatively short book. It looks at Shin's years at the prison camp, what happened to him after his escape and how he acclimated to America; but it also provides some background and history of North Korea. Basically, I found just about everything in this book to be pretty incredible and interesting, and I'm hard pressed to come up with a favorite part. I found the sections about Shin's years at the camp to be horrific and they reminded me of some of the Holocaust books that I've read in the past. Many of his stories were larger-then-life and quite difficult for me to grasp from my cozy couch in Central PA. What I can say for sure is that Shin's life experiences reminded me of just how fortunate I am to be born in America. I think I all too often take things for granted. The parts about Shin's escape were also intriguing especially as they pertained to Shin's ability (or inability) to fit into society. I thought it was interesting just how much luck played a factor in his escape and I was amazed by Shin's courage and resourcefulness. I probably shouldn't have been, but I was surprised by how hard the transition to "normal" society was for Shin. He had only ever lived in a prison camp and been treated horribly by almost everyone including his family. He didn't understand kindness and had a difficult time trusting individuals nevertheless making friends. While there are organizations in place to help him, I think Shin is still trying to cope with all of the changes that came with his freedom. Finally, I appreciated that Mr. Harden did provide some background about North Korea's political system. I knew the basics, but it was nice to learn some of the history behind the country. I finished this book in awe that a country with such brutal leaders exists in our world. It truly scares the heck out of me! I have to give a lot of credit to the author for tackling this story. I'm sure it wasn't always easy to research and write, but I think he did an excellent job of showing the many sides to this story. Shin wasn't always the most reliable of storytellers. I am not saying this in a critical way at all because I have no idea how Shin is even able to speak about the atrocities he experienced, but his story has changed a few times along the way. Mr. Harden no way shied from showing the positive and negative aspects of Shin's character, and I actually am more willing to accept this book as truth because of that. ESCAPE FROM CAMP 14 is a very special book about an unbelievable man's story, and I think all Americans could benefit from reading it. Highly recommended. I love non-fiction and I would love this book. That crap going on over there in NK is mind-blowing. I have a recommendation. Even if you don't read graphic novels, get your hands on Pyong Yang. It is so good. You won't be able to put that one down either. This sounds like the kind of nonfiction I enjoy. Definitely my kind of read. My fingers just marched over to my library website and I am now third on the reserve list for this title! Wow! I'm kind of embarrassed to admit that I don't know that much about Korea either and my father served during the Korean War. This book sounds like a must read! Can't wait to read this! Definitely going on the to read list! I knew I had to read this book when a customer of my local indie (and a member of my book club) raved about it. While it is quite the somber topic, I'm looking forward to reading this book. I have this on HOLD at the library. This does seem like a book that could be depressing, but I think it's one I'll try to find. This is the kind of nonfiction I gravitate toward, and it's good that people are getting information out there about how horrible things are in North Korea. I've only read a few books about it though. Wow, this sounds really good!